Summer can be a time of great leisure, relaxation, and fun. If you are a working parent, it can also be a time of incredible stress as you try to figure out how to juggle your child’s schedule with your own. Camp offers a fantastic solution to this problem. However, picking the right camp is important. You want to send your kids to a place where you know they will be safe, where they will learn, and where they will have a chance to take important and valuable experience away from their weekly attendance. 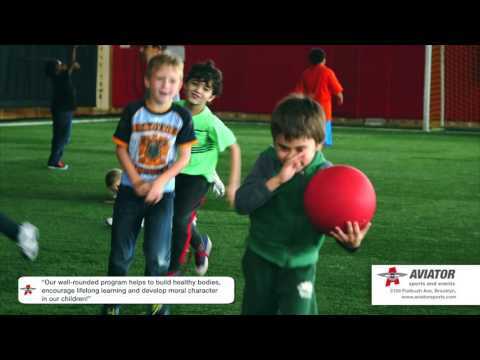 Here are the five ways that the summer camps at Aviator Sports and Events Center will help your children grow socially. Interaction with our experienced and passionate staff– Camp Director Jason Vasquez and Coordinator Desiree McKoan are two of the most energetic and enthusiastic people running summer camps in the New York area. With well over two decades of experience between them, they ensure that programs are well organized, smoothly run, and are properly and responsibly staffed. The staff at Aviator is handpicked through an interview process to ensure that the counselors and directors interacting with your children are some of the best the city has to offer. After all, the children spending their summer at Aviator will be at the facility more than they will be in their own home each week. The people watching over them are a major priority. Opportunity for self-discovery- Camp gives kids the chance to truly find themselves. Whether it’s stumbling upon a sport they will participate in for the rest of their lives, or sparking up a friendship they will hold forever, camp is a fantastic opportunity for children to grow and learn about their own person. Their school life can become extremely monotonous, and their home life does not necessarily give them the chance to interact with their peers regularly. Camp, however, supplies young people with the best of both worlds. They are surrounded by people of the same age group outside the context of school. This unique opportunity for interaction and exposure can be highly beneficial. Leadership skills– There is a common misconception that leadership skills are only relevant to people who are in charge of something. This could not be further from the truth. Even if your child may be shy by nature, camp encourages leadership skills such as pushing one’s personal boundaries, or learning to communicate with others more clearly. These character building experiences are not only impactful merely at camp or in sports, but rather are crucial to everyday life. School can be a suppressive social environment through its cliques and boredom, but camp gives some children the first true opportunity they will have to foster leadership skills in an environment surrounded by like people. Learning to interact with people that are different– New York is one of the most diverse cities in the world, in every sense of the word. Camp gives kids a chance to meet others from any given ethnic, religious, economic, or social background that anyone could possibly imagine. Aside from that very awesome prospect, camp may also present your child with the chance to deal with someone they do not like all that much. Learning to show all people respect is a value that our counselors promote through their words and actions, and it is a value that your child will be held accountable for at Aviator. On the more positive side of this coin, the melting pot of cultures will help your child learn something new about other people. This could be another culture’s value on learning, another culture’s value on respect, or something as silly and fun as a food they have never tried before. Interpersonal relationships– Alluded to in almost every item on this list, the chance for a young person to interact with others is the biggest and most important opportunity they will have at Aviator Summer Camps. While they will spend their time surrounded by people of a similar age, they will also get to know Aviator’s counselors, directors, and coaches. Jason and Desiree both agree that seeing a former camper and their family years later and being remembered is one of the most rewarding parts of their job. Whether it be the exceptional staff at Aviator, or the other campers your child will meet along the way, there is no doubt that the people involved in the camping experience will be the highlight of your child’s time! Aviator’s camp programming is brand new for 2016 with new age appropriate groups and exciting trips. Not only will campers be exposed to a wide variety of sports, but they will get to swim, ice skate, race pedal karts, and participate in reading and math initiatives. Learn more about all Aviator has to offer and register today.